A house looks beautiful by enhancing the interiors as well as the exteriors through the medium of lamps, sofas, divans, carpets etc. Carpet has always been an exclusive item for the decor and is increasingly in demand due to its several designs and structures. recent times numerous patterns and textures have overpowered making carpets one of the focus in the interior designing. If the walls are of neutral or cream color some rainbow shades adds interests and dimensions to it, as well as masking the spills and spots. Kids, pets and parties can be a menace for the beautifully sculptured carpets. Spills, vomits, and strong stains can ruin the appearance and the material of the carpet. There are lots of ways to clean this mess with different materials like vinegar, baking soda etc. and immediate treatment with a specially formulated carpet solution can save it. It is difficult to decide how to clean carpet yourself as there are several ingredients and processes present which will work on the spills according to the place whether it is the carpet area or the wall. The prime most important ingredient used in cleaning of the carpets or the walls is vinegar which is coupled with baking soda. Sprinkle some baking soda on the carpet stain and top it with vinegar, a gaseous eruption starts which is subsequently absorbed and can be removed with a soft cloth. Another way is to spray the detergent solution onto the stain, blot and dry it. You an alternatively use vinegar or lukewarm water as the spray solution while rest of the procedure is the same. Repeat the above steps to remove the stains from the carpet. The vinegar used can be replaced with an ammonia solution and the whole process will be followed in the similar manner. The stains of dirt or mud can be removed by vacuuming it and then rubbing with a wet detergent cloth. Ceilings and Wall Cleaning is also part of the cleaning process. The walls are exposed to dirt, dust, pet dander, grease, cooking oils, smoke and other materials. So it is important to clean these areas as well using home remedies or carpet cleaners which provide these additional features too. It is a prerequisite to know the elementary knowledge of your walls. If the walls are latex based wall paints vinegar or detergent diluted in water works effectively in a bucket of water. This solution can be filled in the carpet cleaner tanks and with less pressure, can be removed smoothly. Walls can have oil based paints too and the oily stains are tricky to remove, so it is recommended to use a degreaser before applying a sponge or your effective carpet cleaner otherwise it will leave permanent marks on the walls. Bissell carpet cleaners also provide a better way of cleaning the dirty walls due to dirt or oil stains. The Bissell cleaners have a big water tank with brushes which work in a two way fashion. It has four modes a normal clean, heavy, light clean and water rinse. It also has an in built water heater system which cleans the floors and the walls effectively. It also has an attachment at the bottom of the machine which is easy and efficacious to use. Every time you clean the walls, the water has to be rinsed out leaving no solutions in the tank and replenish it with fresh water and formulas you are using for cleaning. It removes all stubborn stains as the brushes work in two different directions and can eradicate even a year old coffee stain or pen marks. Bissell has been one of the renowned companies in the carpet cleaning machines used especially for deep stains, pet odor and hairs. These cleaners have to be cleaned via a simplified system of washing the tanks and brushes. It hardly takes ten minutes to complete the whole procedure. If there is still some solution left which was initially used you can easily store the left over in the tank and can apply on the walls or the carpet areas for the next time. Bissell is one of the highly acclaimed companies in terms of carpet cleaning systems. 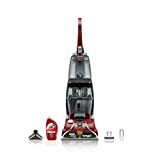 If we consider the Best Carpet Cleaning Machines Review one of it is the Bissell Deep Clean Deluxe Pet 36Z9 which is very effective in cleaning of the pet odor, pet stains and the muddy patches from the carpets making it clean and refresh again. It is light weight, portable and uses particular motions to clean the carpets. How to clean the Bissell Pet Carpet Cleaner if it gets dirty or filled with pets furs and hairs, there is a simple way to clear it off. It is advisable to fill up the tank with clean water according to the measurements along with Bissell Deep Clean + Antibacterial formula. Now perform the functions as directed in the user manual where deep cleaning is processed. The Deep Clean solution should be made as per the directions and no other solutions should be used as it can harm your machine. 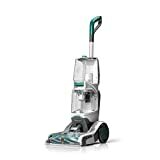 Another one is Bissell Big Green popular among the others and cleans larger carpet areas with its two ways cleaning process. The various carpet cleaning machines stated above have set new standards for cleaning obstinate stains and spills without affecting your routine work and peace of mind. They have assisted pet owners and other people to get rid of the filthy marks on the beautiful patterned carpets. The carpet cleaners harness the water and helps in cleaning of the floors and carpets more effectively. These carpet cleaners have also helped to remove pen or pet marks on the walls. They are even beneficial for the wooden floors and tiles without causing any disruptions or breakage. Carpets add to the beauty and decor of the house making the living room more lively and subtle. Now-a- days different textured and patterned carpets are increasing in demand. They are now sorted as not only carpets but even as rugs, kilims and durries. A living room is a place to relax and socialize with people so it should have unique items of furniture, antiques, lamps, show pieces, carpets. Carpets have been widely used since olden days for sitting or decorating the main entrance of the houses. So it becomes vulnerable to being dirty by mud, pets, children, hairs. Initially people used to wash these carpets and dry it in the sun, but slowly it changed to vacuum cleaners which by means of suction used to remove all the dirt. In recent times carpet cleaning machines have given another means to clean and refresh your carpets. “How to clean carpet yourself” is a big question asked by lot of people while buying carpets and rugs. The stains and spills on the light shaded carpets can destroy your mood as well as peace of mind. The beautiful hues of the carpets can be spoiled by coffee stains, colors or parties. It is tough to remove the stubborn stains but there are some ways to clean them. One of the widely accepted ways is the use of vinegar coupled with detergent solution, and then blotting with a dry and clean cloth. The coffee or tea stains can be removed with the help of beer which can be slightly poured over it and then rubbed with a cloth. The stains can also be eradicated through the use of ammonia solution mixed with double the quantity of water. For darker stains you can mix two tablespoons of salt in ½ cup of vinegar with two tablespoons of borax mixture. Shaving cream also works well on grease and fruit juice stains. Ink stains are a menace to the carpets so they can also be removed by mixing a paste of corn starch and milk on to the stains and letting it dry for some time. The residues can be vacuumed and subsequently removed. If the stain is of unknown nature then you can use 3 percentage of hydrogen peroxide with a little of toothpaste and rubbing it on the stain. Ice cubes and dry cleaning agents can be used for removing stains and spills. Paint removers are another reagents used for removal of hard stains. The stains can also be removed with the help of carpet cleaners which work on a push pull technique. Bissell is a renowned company which makes highly acclaimed carpet cleaners. Bissell carpet cleaners are of different types like Bissell pet carpet cleaner, Bissell spot cleaner, and Bissell steam carpet cleaner. Bissell Pet carpet cleaner is one of the best cleaners which are used for removing pet odor, furs, hairs and pet stains from the carpet. On the other hand, Bissell spot cleaner is employed for clearing hard stains and spots from places where it is hard to reach and difficult to clean. Bissell Steam Carpet Cleaner is also an effective carpet cleaner for reaching out to small areas and cleaning dirt, mud and stubborn stains. tank according to the prescribed limits of the user manual and perform the rinsing actions. Firstly, switch off the power and unplug it. There is a small button at the front of the handle which connects the solution tank to the machine. The second tank which is the recovery tank on the opposite side also has to be removed. Both the tanks are rinsed with warm water and cleaned. The nozzle and the cleaner head are sponged with a damp cloth. There are two brushes present which is cleansed under cold water so as to remove the dirt and debris collected during its use. There are lots of carpets cleaning machines which work in different ways to remove these stains. Some of them are light weight, affordable, working in two directions as well covering larger carpet areas. 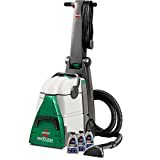 If we compare the Best Carpet Cleaners Review by those who have been using, it will be evident that Bissell Big Green has lot of features which overpowers the other brands of carpet cleaners. Its two way motion and compatibility has made it a popular choice. Carpet cleaners are very important in today’s world as they reduce the time and work load of cleaning the difficult areas and the stubborn stains. A large variety of carpet cleaners with different modes and features are available and you can pick the one which matches your requirements and is cost effective. Best Steam Carpet Cleaners are being widely used by working class of people who can devote just half an hour for cleansing of the stains and marks. People having regular parties at their homes have become quite relaxed with these new inventions of technology and can enjoy with children without having any fear of destroying their favorite carpets, walls, rugs or durries. The woven or embroidered carpets can also be cleaned with these carpet cleaners as they are safe to use without affecting its weaving. Markets are loaded with variety of cleaning and antibacterial solutions and are carpet cleaner friendly too. Regular cleaning of the machine and its parts along with oiling can help to reduce the wear and tear and can be kept in a better condition for quite a long time. These unique devices have assisted in keeping the beautiful textured carpets in a proper condition. The first step in caring for the carpets in your home is daily vacuuming. This process will remove over eighty percent of loose dirt, improving the appearance of and extending the overall life of your carpet. However, vacuuming is not enough. Deep extraction cleaning is necessary to remove embedded dirt from your home carpets. Because carpet fibers are made to hide the presence of dirt, the extent to which your carpet is soiled may not be readily apparent. Thus it is important to have your carpet deep cleaned periodically, even if it does not look dirty. This should occur at least once per year. You can either hire someone to perform this job, or do it yourself with Carpet Steam Cleaners. 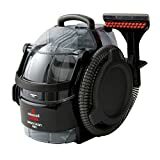 Buying your own steam cleaner can be a large convenience compared to renting a machine or hiring someone else to do it. Before you choose to rent or buy a carpet cleaning machine, you should compare steam cleaners available from various manufacturers. Not all steam cleaning machines are the same, and shopping around can allow you to acquire the Best Carpet Steam Cleaners for your needs. You should check your prospective steam cleaner for ease of use. It is also worth knowing how difficult it will be to clean the unit when you are done with the carpets. Carpet Steam Cleaners come in a dizzying variety, with a wide assortment of attachments. Many steam cleaners add rotating or moving brushes to their arsenal to scrub packed soil out of your carpet. The number of brushes, normally between four and six, will factor into the price of your steam carpet cleaner. Carpet Steam Cleaners come in upright or canister types, the same as vacuum cleaners. Uprights are heavier, but better for cleaning large areas. Canisters can be convenient for cleaning small areas, car interiors, and furniture. Different steam cleaners use different tank designs. Most hold about a gallon of hot water and cleaning solution. While some canister models hold more, you must be careful not to get one with such a large capacity that the water cools before it can be used. Most people seem to prefer steam cleaning machines that have separate reservoirs for the cleaning solution and dirty water. Some steam cleaners can also be used on hardwood floors, for added versatility, and can be used for vacuuming as well as steam cleaning. If you have limited storage space, you may wish to consider a steam cleaner that has a folding handle or disassembles for storage. Regardless of the choice you make, be sure to compare steam cleaners before purchase, to make sure you have the one that is right for you.